Dr. Ian Gordon Holsworth graduated in 1991 from the University of Melbourne and spent 8 years in general practice before becoming an examined Member of the Surgery College of the Australian College of Veterinary Scientists in 1995. Following a position as Staff Surgeon for an eight-practice small animal veterinary group in Melbourne, Dr. Holsworth relocated to Michigan as a Surgery fellow in the Michigan State Veterinary Teaching Hospital. At the conclusion of the Fellowship, Dr. Holsworth commenced a three-year position as a small animal surgical resident at the University of California, Davis Veterinary Teaching Hospital, which he completed in July 2003. Currently, Dr. Holsworth is the practice Director and Senior Surgeon of VetSurg, in Ventura, California. 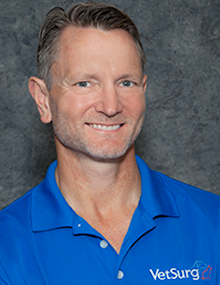 He is also the Curriculum Coordinator and Lead Instructor for Arthrex VetSystem’s North American CE program. This CE program includes didactic lectures and instructional labs which are hosted in University Vet Schools, private surgical labs and in combination with national veterinary CE conferences. A dedicated educator, Dr. Holsworth has spent the last fifteen years in a clinical and surgical instructor role, presenting at many national meetings in the United States, Canada, the United Kingdom, Europe and Australia. Topics covered include shoulder, hip, elbow, and stifle disease in dogs with particular focus on advanced imaging, arthroscopic assessment of juvenile orthopedic disease and arthroplasty. Dr. Holsworth has also been the Chair of the ACVS Surgical Summit arthroscopy & joint surgery lab for the past ten years. Most recently, in 2018, Dr. Holsworth was designated by the Board of Regents of the American College of Veterinary Surgeons (ACVS) as an ACVS Founding Fellow in Minimally Invasive Surgery. Joining a select few in the world with this accreditation, Dr. Holsworth was selected for his exemplary training, experience, and practice in the multidisciplinary approach to the prevention, diagnosis, treatment, and rehabilitation of patients undergoing minimally invasive therapies and for his devotion to research in the field of minimally invasive surgery.